On 9 July, H.E. 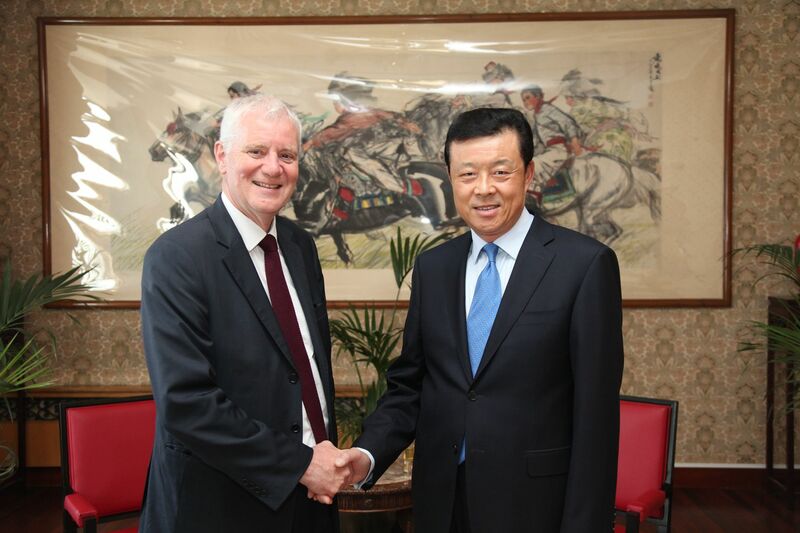 Ambassador Liu Xiaoming met with Sir Martin Davidson, newly-appointed Chairman of the Great Britain-China Centre (GBCC), at the Embassy. He exchanged views with Sir Martin on China-UK relations and the exchanges and cooperation between the GBCC and its Chinese counterparts. Executive Director Richard Pascoe of the GBCC was present. Ambassador Liu congratulated Sir Martin on his appointment as GBCC Chairman and said that China-UK relationship is on a fast track featuring all-round cooperation and development. President Xi Jinping's state visit to the UK this October will mark the beginning of a "golden time" of China-UK relations. The GBCC has long engaged in the facilitation of party, legal and youth exchanges and cooperation between the two countries. The Ambassador hoped that under the leadership of Sir Martin Davidson, the GBCC will seize the opportunities, further strengthen exchanges and cooperation with China and make new contribution to the development of China-UK relations. Sir Martin briefed Ambassador Liu on GBCC's programmes of exchanges and cooperation with China and said that the GBCC's sound collaboration with China has benefited from the healthy and steady development of the bilateral relations. He thanked the Chinese Embassy for its support over the years. The GBCC is ready to work with China for greater achievements in bilateral exchanges and cooperation and to contribute to the "golden time" of China-UK relations.